VICTORIA, B.C. — The people of Victoria have felt the pain of the losses in Humboldt, and have stepped up. 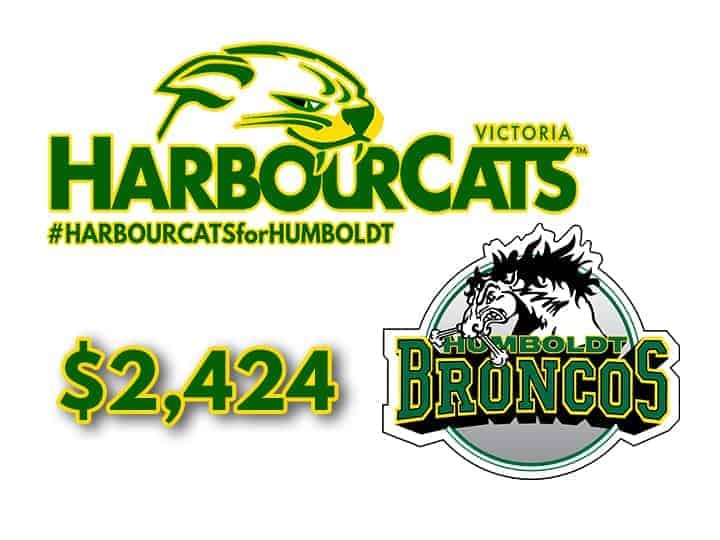 Including hundreds of dollars of straight money donations brought into the team office, the Victoria HarbourCats helped raise $2,424 in donations that will be sent to the Humboldt Broncos this week. All proceeds from merchandise, 100 per cent of sales, from this past week have been donated to the cause, helping that community recover from a bus crash that killed 16 people involved with the SJHL’s Broncos. The effort is not over, either. The HarbourCats are now also selling stickers, two different sizes, to raise more funds to help out. The smaller stickers are selling for a suggested $5, the larger ones for a suggested $10, and all funds will go to Humboldt. The stickers are available at the team office, 1814 Vancouver Street. “It was a tough week for people across Canada, and we’re glad to do our part to help, even if in some small way,” said Jim Swanson, Managing Partner of the HarbourCats. The HarbourCats are also announcing today that they will wear Humboldt Broncos hats on Opening Night, June 1, to honour the fallen Broncos. Plans will develop to use those hats to raise further funds to support the Broncos. 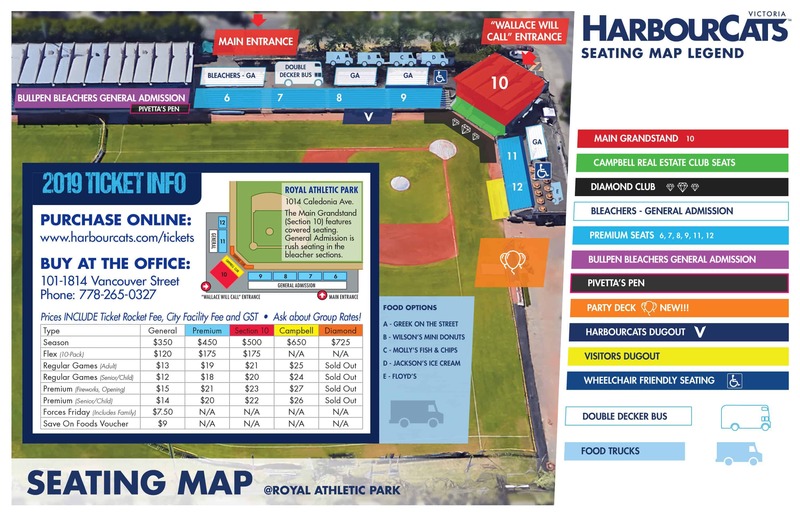 The Victoria HarbourCats are pleased to announce more signings from great programs, preparing for the 2018 season, which is just more than six weeks away — the first pre-season game is at Wilson’s Group Stadium at RAP on May 30, with the home opener on June 1. OF Blake Wagenseller, Cal Poly — 6-1/200m RH hitter/thrower, from Poway, CA, freshman at Cal Poly, played on 2016 USA Baseball national champions, hit .318 with 32 RBIs in summer ball last year. RHP Aidan Goicovich, Cal Poly — 6-3/205, from Gilroy, CA, posted a 2.14 ERA as a senior in high school. IF Nick Evarts, Purdue — 5-11/185, from Colleyville, TX, has been middle infield partner of former HarbourCat Harry Shipley most of the season, a junior who transfered from Weatherford Junior College where he hit .350 and .357. RHP Tyson Cronin, Oklahoma Wesleyan — 6-0 righty formerly at Pierce College in WA, from Lakewood, WA, is 8-1 in 11 starts with a 1.09 ERA this season, giving up just 46 hits in 66 innings. LHP Ryan Rutherford, UC-San Bernardino — A 6-2/200 freshman from Corona, CA, can be used as a starter or out of the pen. RHP Jeremy Jess, Pomona-Pitzer — A 5-10 right-hander, sophomore, from San Luis Obispo. Can also hit, has a home run this season. On the mound is 2-1 with a 5.79 ERA, coming back from shoulder tightness. RHP Tyler Yoshihara, Pomona-Pitzer — Sophomore, 5-11 right-hander, from Saratoga, CA. Is 5-1 with a 3.08 ERA, giving up 47 hits in 61 innings, including two complete games. RHP Jacob Potter, from Victoria, 6-2/215 pitcher at Allen CC in Kansas, freshman who graduated from Spectrum in Victoria. Has struck out 41 in 38.1 innings, making 11 appearances.